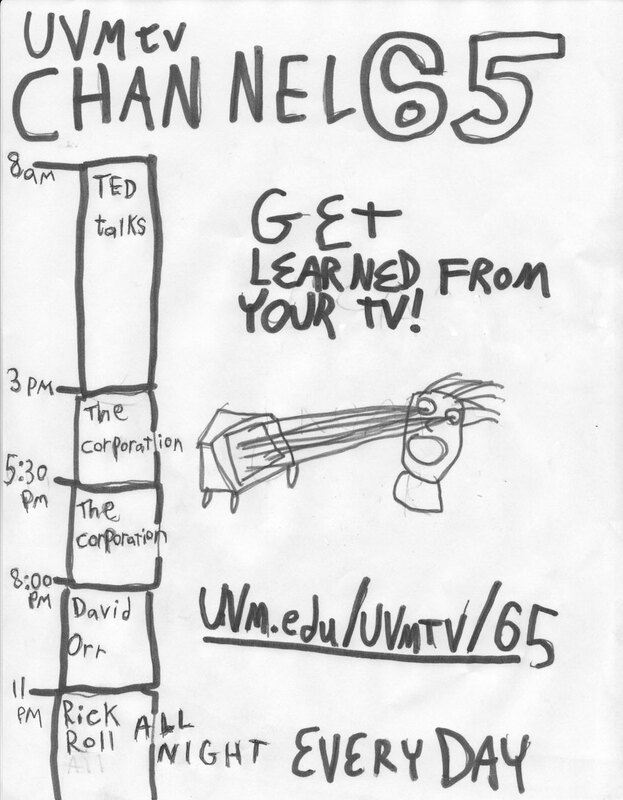 During most of my career at the University of Vermont I worked with the UVMtv club. This page details that experience. For several years I served as the technical director at UVMtv, the campus television station at the University of Vermont. In the fall of 2007 many of the channels UVMtv operates were non-functioning. There were several channels that we had permission to broadcast on which nothing played on. I fashioned a makeshift video server from spare PowerMac G4 and hooked it up to channel 65. The rest of the club was preoccupied with making the club a profitable business so they could purchase a "proper" video server. So I had the station to myself. Posters to advertise, a website, programming line up, show production, I did it all. The server functioned thusly: alarms were scheduled in iCal which triggered video files to be opened and played fullscreen in quicktime. The bonus of having the lineup in iCal was that I could synchronize it with Google Calendar and then post the lineup on the website. I taught myself Applescript to control the playback of the videos. This ran smoothly most of the time, but when it didn't I would VNC into the server from wherever I was (was able to VPN in when I lived off campus) and fix it. The original lineup was my favorite TED talks from 8am until 3PM followed by The Corporation, twice, at 8 a lecture by David Orr until 11pm when I looped Rick Roll all night. Later, I had iTunes play UVM's radio station WRUV through the music visualizer Kaleidostrobe during the night. At some point I came upon another outdated PowerMac and put it to use streaming the channel to Ustream. It pulled in the feed right from the broadcast PowerMac via a DV camera which was not in use due to a faulty tape drive. This was significant because previously students were only able to view UVM in their dorm room, now it was available around the world. I advertised this new ability with a flyer. During the fall of my junior year, the iPod Touch came out. I bought one as soon as jailbreaking was possible. I was able to VNC into the video server from my iPod. Sometimes I would fire up a drawing app on the server. This gave me the ability to have whatever I drew with my finger on the iPod to be displayed to anyone's TV on campus who was tuned to that channel. This was great fun. Sometimes my friend Ben Bonaccio and I would do a TV show we called "the Sim City Show." It involved me VNCing into the video server, playing Sim City 2000 on the server and Ben would play synthesizer over it. It was pretty bad but for some reason I felt compelled to upload all our episodes. Episode 2 is the best one. During my junior year, I lost my room key. Instead of paying for a new one, I hooked a camera up to the server I ran in my room. I ran BTV Pro in motion detection mode so I would be able to catch anyone trying to steal something (luckily this never happened). One day I was bored in line at the dining hall so I decided to pull a little prank. There was a big flatscreen TV facing the line. I VNCed into the server in my room from my iPod and started broadcasting the feed on Ustream. I then VNCed into the video server and had it display the Ustream feed full screen. So now everyone in line (and anyone else on campus on that channel) can see the live view from my room on the big screen. I then called one of my roommates and asked him to check if I left a book in my room. Everyone sees him looking around my room for the book. Once he had his face up close to the camera I told him "Surprise! You're on candid camera!" He laughed and waved. Good times. I redesigned the main UVMtv site based a Movable Type blog platform UVM was offering back then. It was easy to create blogs so I made one for each show. Thusly, each show had it's own podcast which synchronized with any videos they posted through the blog. There was another channel that wasn't being used as well as some old VHS cameras sitting around the studio. I focussed the camera out the window and hooked it up to the channel feed. The camera was focussed on a concrete sculpture known as the Flying Diaper. The channel became known as the Diaper Cam. I piped in the campus radio station, WRUV into the audio for the channel. Deep Space Trav was a weekly space themed talk show I hosted from 2006 until 2009-ish. It was usually shot at UVM's now dismantled, multi-million dollar studio in Rowell hall. I would often play a synthesizer on the show. Guests were most often my friends but sometimes professors. We talked about space and the future. All the episodes were recorded though most have been lost to the sands of time. But the ads(1, 2, 3) for the show, which I was honestly more into anyway, are all saved online.